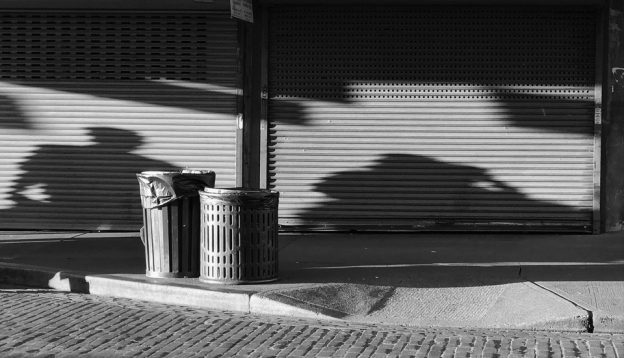 Street Photography gives value to everyday life coming from chance public encounters. 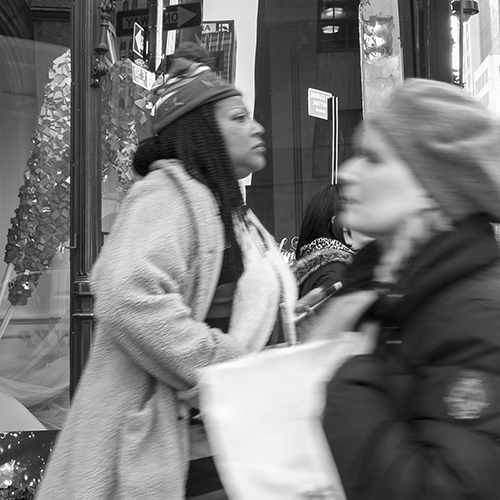 The focus on people observed in passing or on the remnants of their presence without them actually being there. An emotion, gesture or behavior tells a story worth remembering. Allusion to people walking by this site in an urban setting of historic buildings that are the centerpiece of tourism in Seattle. Pike Place Market in the evening is a quiet reminder of place in its purest sense. 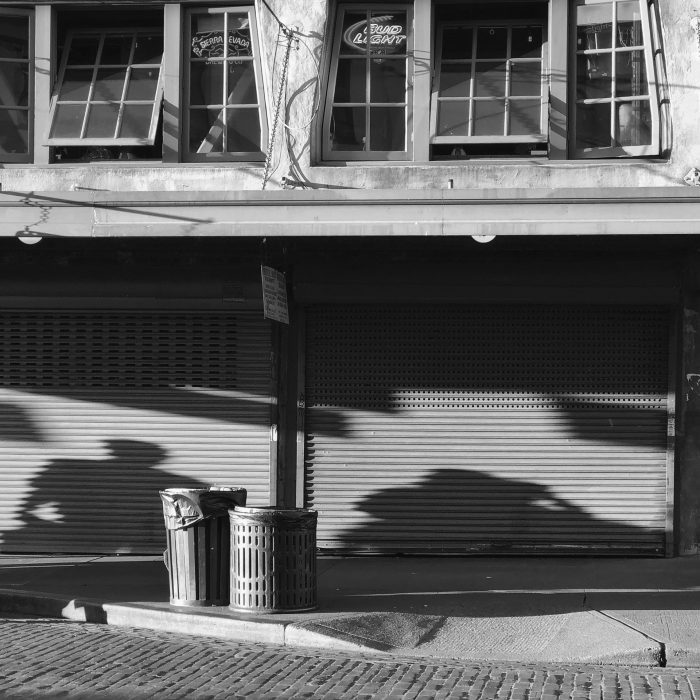 The shadows remind us that at all hours, there is life coming and going in the back corners of cities. 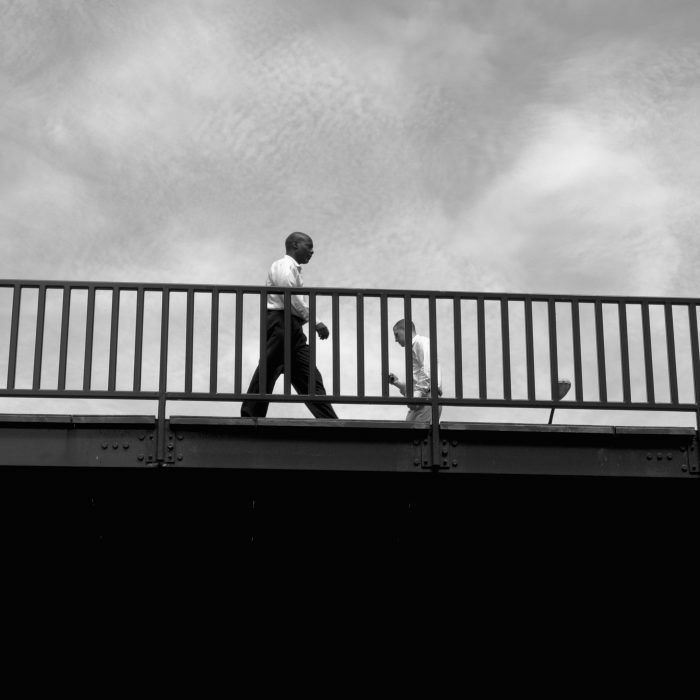 Two men crossing on a bridge do not acknowledge one another as they pass. There is a sense of isolation and separateness that is intentional... a choice not to engage. Two Women walk parallel with no eye contact or awareness of one another. Both are in separate spaces as their paths cross. Yet, they had seen one another from the distance. 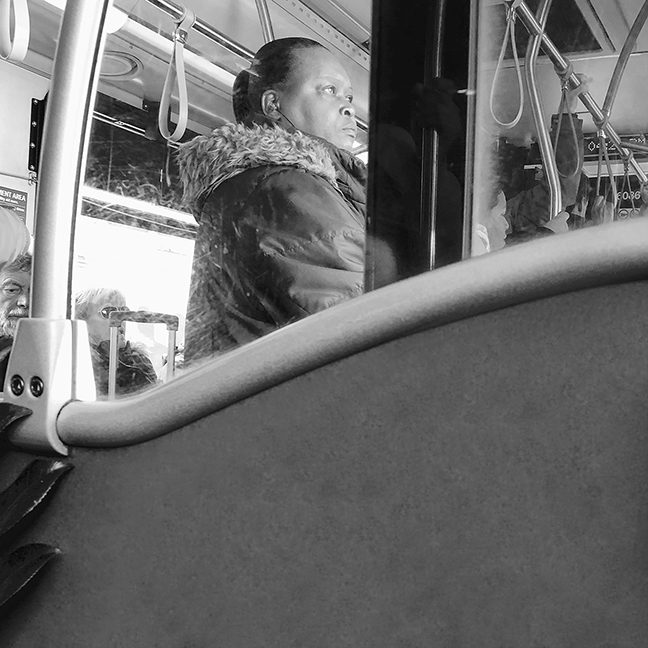 Focus is on woman listening to music during a busy and long bus ride. Her face is expressive with determination to endure or ignore the activity around her that was disruptive. 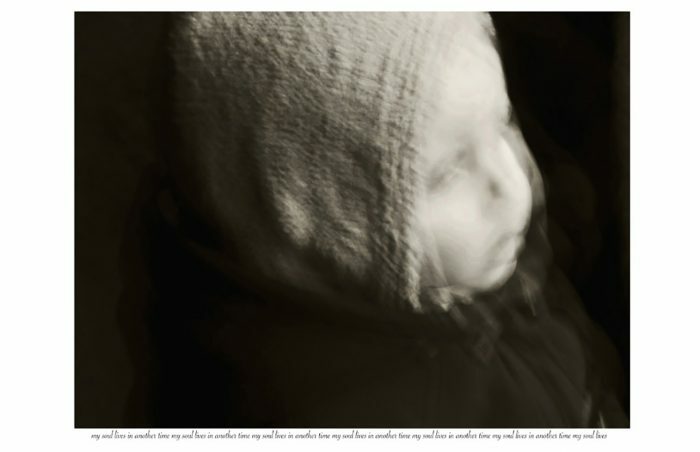 This candid portrait is about mood and emotion. 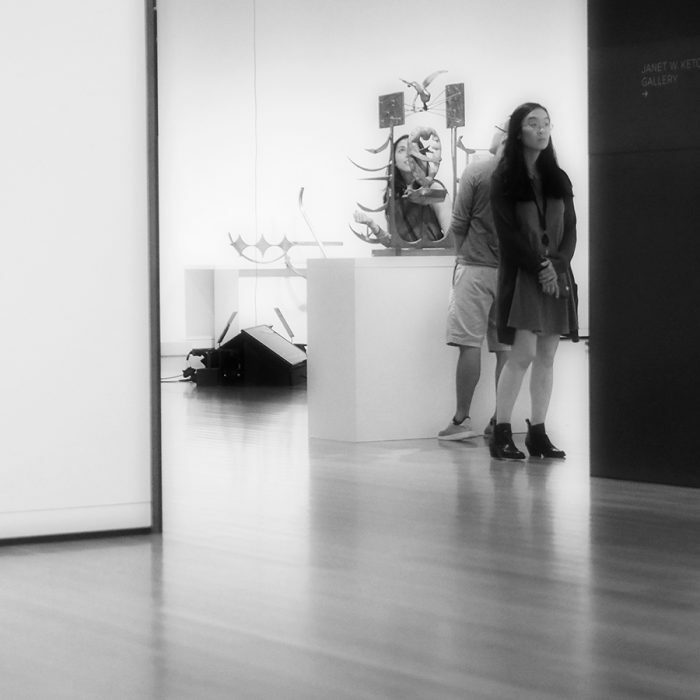 July 5, 2018 Art Walk at the Seattle Art Museum, 3 visitors are transfixed by the work they see. Both the sculpture is being closely inspected as is the two dimensional work on the wall. This is an example of wonderment and curiosity as seen in their facial expressions and body language. Homeboy is a look at contemporary culture and vernacular language. 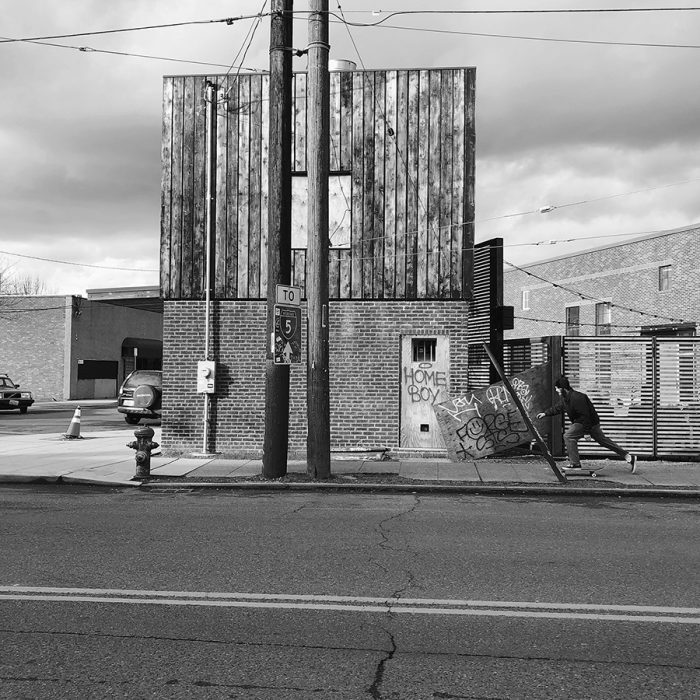 Photograph taken in the Georgetown neighborhood of Seattle where there is a large arts and alternative culture presence. The skateboard is both used for sport, pleasure and as transportation and is part of Homeboy life. Flower Vendor ends his work day catching up on phone messages. 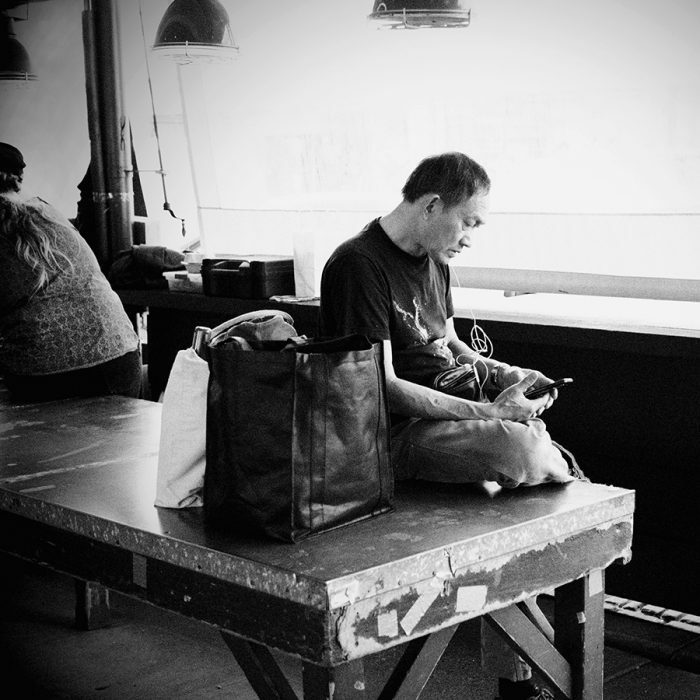 Sitting quietly behind the closed shade disengaged from the person sitting behind him. This “street” portrait is a behind the scenes look at the iconic market and the vendor’s life after hours. This entry was posted in Past Exhibitions on August 17, 2018 by Chloe Wright.